ianmabberley	What's New	Comments Off on Bye-bye Wolfie! A somewhat different blog today. A week ago we were woken at night by a dog barking outside. In the morning we were greeted by the owner of the bark, who it appeared had adopted us. He’d helped himself to the cats food – much to Smudge’s disgust – and was happily lounging about in the sun in the yard. Over the next few days we tried to find out if he was a local farm dog who’d just got lost – the weather had been pretty nasty the day he turned up – but without any success. He’s pretty distinctive, with a white blaze over his head and a white tip to his tail, plus piercing blue eyes – a bit husky or wolf-like, thus the name! Oh yes, and he howled at the moon (well, first thing in the morning, anyway)! A call to the Police saw us passed on to Powys County Council, who basically denied any responsibility for collecting him. So then it was a case of trying to find other avenues through which to make sure he went to a good home. Eventually, next door neighbour Tim found the details of a rescue centre in Pontypridd, who we finally managed to get in touch with – but who didn’t know where Powys was!! There’s Valleys for you! They confirmed that Powys did have the responsibility and so another call to the Council and a completely different answer – “Yes, give me the details and someone will call you back.” Later that afternoon a chap called Mark phoned and we agreed he would collect Wolfie the following morning. This didn’t seem to be a problem, except Wolfie took it into his head to have a bit of fun before he left. Spotting Emily through a half open gate, he set off in pursuit. To be fair dear old Emily (also known as Fat Cat) showed him a clean pair of heels but ended up some thirty feet up a tree! Then whilst Sue was up the ladder trying to coax her back down, Wolfie spotted the chickens and chased them round and round their pen! 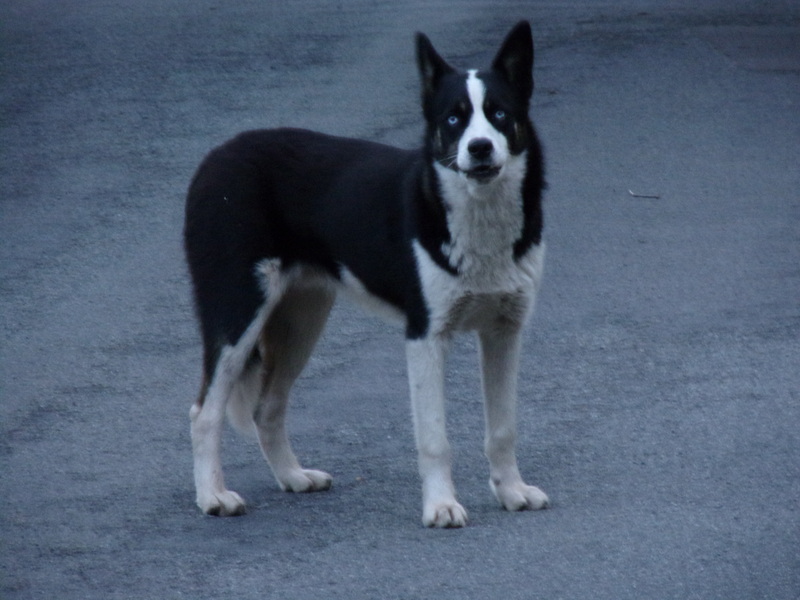 Finally exasperated – he’d also trodden on some flowers and chewed some new plants – Sue managed to get him to follow her into the sheep shed, where he spent his last night with us – howling at the unfairness of it all. In the confines of the shed he finally decided that I wasn’t going to beat him and rolled over to let me tickle his tum and lick my fingers. Mark’s wife, Emma arrived to collect him as agreed in the morning and with the aid of a bit of baler twine he was brought to her truck. He wouldn’t jump in but was happy to be picked up and put in the back, from where he continued to be all sweetness and light as he was driven away, hopefully to find a loving home.